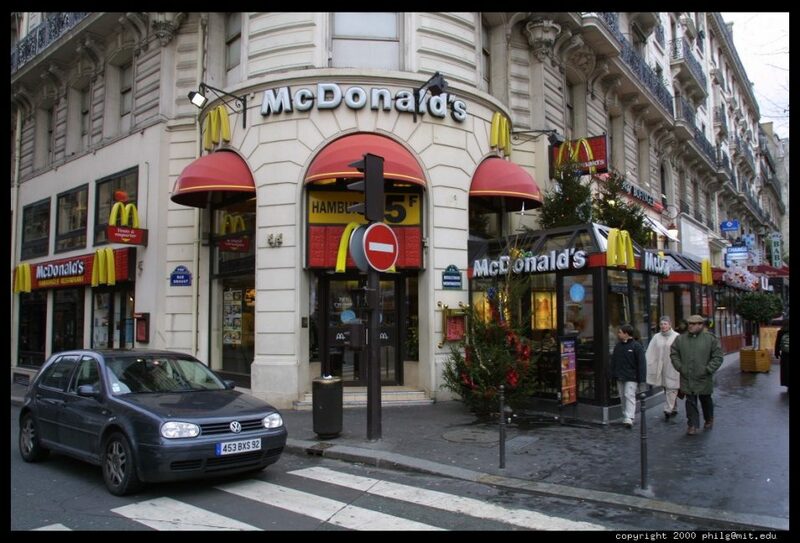 How can you love McDonalds in France? It is a country renowned for its rich cuisine and fine wine. Stepping foot in a McDonalds is like thumbing your nose at the French heritage. There is nothing that we love more than sitting in an outdoor cafe, drinking wine and sampling rich cheeses and cured meats. Like the French, we have a love affair with their food. We couldn't wait to peruse the menu of a restaurant and choose something mouth wateringly delicious. The prix fix menus were our favourites as we could sample a few dishes at a time. Oh yes, we loved eating in France. The last time we were in France was in 2002. McDonalds hadn't caught on in Europe as it has now. When we entered a MickyD's in Paris, it was void of people and had different items on the menu than we had in Canada. It just wasn't right. Today, it is immensely popular and filled with crowds. Families sit around the tables for their “meal out” just like my family did in the 70's. Going to McDonalds then was an event for us and it looked as if it was an event for some of these families in France. We saw several generations of people sitting together enjoying cheeseburgers and Big Macs. It was nice. It gave me a warm and fuzzy feeling seeing people out enjoying themselves together. While it is not an event for us we do enjoy the odd Big Mac every once in a while. McDonalds isn't our first choice for a meal out but we are not against it. We pop into one in every country that we visit. India has some great vegetarian choices. So why did we like them so much in France? 1. Free and Clean Toilets – McDonalds has the same standards around the world. We knew that if we had to go to the bathroom, we could duck into a McDonalds without fear of having to pay a fee or buy a coffee. There aren't a lot of places to go to the bathroom in France. (at least that we could find) In Canada, we have fast food and Tim Hortons donut shops everywhere so we never really have to plan our pee stops. We can always duck into a place to relieve ourselves. Many times in Paris, I would be stuck walking for far too long with a full bladder looking for a public toilet or place to go. When I saw the Golden Arches, I breathed a heavy sigh of relief. 2. Coffee to go – I don't think it is part of the French culture to drive or walk with a coffee in hand. It is a tradition to sit down and savour a rich and delicious cup a joe while visiting with friends and soaking in the atmosphere. Our society unfortunately is always on the go. We rented a car in France and as Canadians, we are conditioned to drink a coffee while driving. At home, we can't go on a road trip without a stop at Tim Hortons. It isn't the best coffee on the planet, but it is a Canadian institution. They have brainwashed us well. We can't go anywhere without hitting a drive through and ordering a “Large Regular.” (large coffee, one cream, one sugar) How were we supposed to drive through France without a coffee to pass the time? Luckily, McDonalds sells coffee to go. Sure, we had to order two cafés each because they are much to small for a road trip, but at least we had our java to keep us occupied on the road. 3. Free Wifi – As travel bloggers, we have to stay connected. 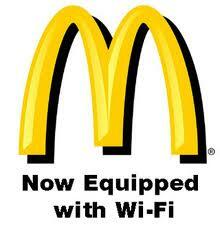 It can be difficult to find affordable wifi and we could always count on McDonalds. We could bring in our laptops in with us, find a quiet corner, plug in to their power outlets and work. All we had to do was buy an affordable meal, coffee or ice cream and we could work for hours on end. People came and went and nobody even noticed that we were there. 4. Parking Lots – We don't know Europe well and we don't know all the little tricks to find free parking. When we entered a new town, we would have to find a public parking lot and pay for our parking. If there was a McDonalds somewhere, we could park our car for a little bit and go for a walk to explore. We didn't leave it for hours on end, but at least we could stretch our legs, get our bearings and decide if we wanted to stay in that town. 5. McCafés – We hear that these have come to North America, but we haven't found them yet. We loved the McCafés. The pastries were delicious and the cappuccinos were rich and creamy. The McCafés brought a certain class to McDonalds. They served coffees and pastries on ceramic plates, they took their time making a proper café au lait and they looked good. The McCafés have their own little section of the McDonalds we visited that made you want to sit back and relax for just a little while longer than you would at a regular McDonalds. 6. Breakfast – Many of the places where we stayed in France only offered breads and if we were lucky a little bit of cheese for breakfast. If we were lucky we could get a little cereal and some jams. While it was great to have a continental breakfast included, we missed our eggs. McDonalds has egg McMuffins just like at home and we would stop in and grab a couple. It was the easiest and most affordable way we could find to get our eggs. 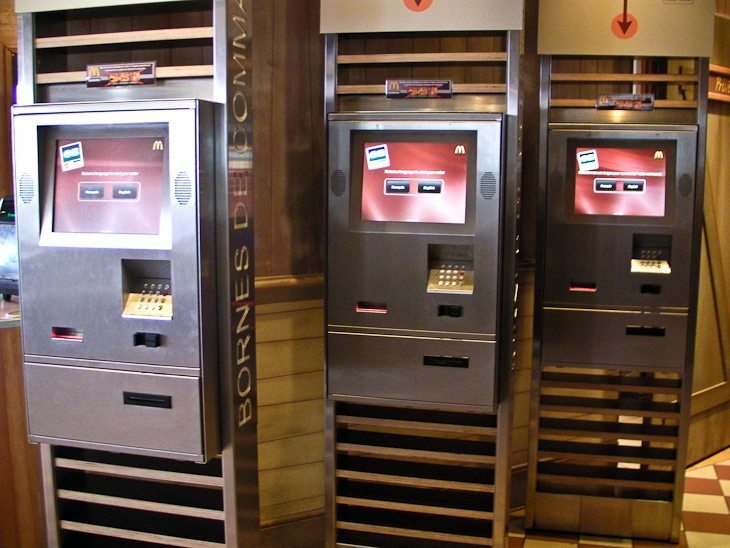 7 – ATM like Machines – We got a kick out of these machines. You may not believe this, but sometimes we would enter McDonald's and the line up would be huge. It was massive and chaotic. I can't believe that we didn't get a photograph because it is the opposite of what we expected. To handle the large crowds, McDonalds has machines placed out front to pre-order your food. You just walk up to the counter with your ticket, and your food is all set to go. 8. Cheap and Easy – Just like in Canada, McDonalds is a cheap alternative. Sometimes it can be exhausting trying to find a place to eat out. Especially on a heavy driving day. McDonalds is an easy choice. It is also fast. We could pop in and get out fast when travelling from one city to another. We entered some cities where we couldn't find a restaurant within our budget. While we mostly shopped at supermarkets when this occurred, sometimes we would just hop into McDonalds to grab some fries to tie us over until we could bring back some food to our campsite. Also, may times in France, restaurants wouldn't open until 7:00 pm. But we were hungry at 5:00, sometimes McDonalds would be the only thing open. So there you have it. Why we like McDonalds in France. What about you? Do you like McDonalds when you travel? 41 Responses to "Why We Love McDonalds in France"
popping across from England to France for a few days next week. Will need a breakfast first morning there (Ibis at 9€ a head is too dear, so went to look to see what McD has on offer. They’ve changed! You can’t access the French website from England! I have to say.. I do like McDonalds and it’s changes. If ONLY they would make a major yet great “future-forward” change; and rethink their harsh RED and YELLOW, “in-your-face” logos and signs!! MC Donalds is wrongity wrong..we all know it BUT i cant resist either its the gerkins that lur me in! McDonald’s saved me from going broke while backpacking through Europe…the ones in Poland especially are great and super cheap! I used to be totally against Mickey D’s, but since they’ve added healthier alternatives I stop at them regularly when I’m driving cross country in the U.S. because, as a vegetarian, it’s one of the few reliable options for salads and such along the Interstate system. From now on, I’m adding them to my list in foreign countries, because you made so many very good points about things like free wi-fi and bathrooms, etc. Great article! .-= Barbara Weibel´s last blog ..Meeting Up With Old and New Friends While Traveling ‘Round the World =-. Thanks Barbara, and the salads in Europe at McDonalds are excellent too! I am so happy to read a nice and positive post about McDonalds’true identity ! I am a huge fan of McDonalds and for many reasons. Having worked in the McDo-system for a few years as a sales manager in Europe I had the privilege of getting to know McDo also from “behind the scenes”. The high standard of quality is something that amazed me, you will not believe it ! Moreover all the free services (from free toilets, free wifi, the newly introduced ATM-machines and more) make of McDo a safe haven for travellers as well as locals. McDonald’s environmental and social involvment is also a sign of their integrity and partecipation in people’s life! McDo is in my opinion one of the very few international global organizations that “truly” do something for people by making them feel good everywhere they are in the world ! Those ATM-like machines are CRAZY! I have never heard of them before but now have a hankering to find one just so that I can order from it. Like you guys, I dig the McCafes and free wifi – it has saved my life on more than one occasion on the road! I am not a fan of McDonalds but all the reasons you give make it a good choice. Seems McDonals are everywhere. We have them in Turkey and I remember someone telling me once, that there was one near the Pyramids in Egypt. .-= Natalie – Turkish Travel Blog´s last blog ..To Travel By Bus Or Plane =-. I didn’t see one near the Pyramids, but we cover all territory I must admit. However, we did sit in a McDonalds to take advantage of their free wifi in Luxor overlooking the Luxor Temple. It was surreal. Here we were in the middle of an ancient land looking out the large glass windows that overlooked the temple. The McDonalds set it up so that you could eat and overlook the temple. It was crazy, but very funny because everyone that we were cycling with on the Tour d’Afrique was crammed inside working on their laptops as it was the only place with free wifi. They are smart those McDonlads Corporate Headhonchos I must admmit. I’m not normally a huge fan of McDonalds, but I have to say, they are a traveler’s fallback plan for all the reasons you’ve mentioned. Especially the free public toilets. And the coffee to go. And just being able to grab a quick, cheap bite to eat when you need one. We all roll our eyes at them, but I for one am glad they’re there when I need one. It makes the travel experience just a little bit easier sometimes. .-= Gray´s last blog ..Stephanie Lee- An “Un-Average Girl” =-. Hi Gray, Agreed. Many people either hate Mcdonalds or don’t admit that they eat there, but we have to say…whenever we are travelling, the McDonalds are packed with tourist and locals alike. I have been to a few McCafes in Europe to use the bathrooms. Not all of them are free. In Budapest, one of the McCafes charges 100 forints (about 50 cents). .-= John Bardos – JetSetCitizen´s last blog ..Interview with Nomadic Day Trader- Marcello Arrambide =-. I didn’t know that not all were free. I don’t understand why there are so many pay toilets in Europe. We have so many places to go it is never a problem and places are never over run with people using the toilets. but then again, we do have much less of a population than anywhere else. But then again, the US has a large population and I never see anywhere there either that has pay toilets. Hmm, Interesting. McCafe?! How cool is that? Not to be rivalled with Tim Horton’s, of course. I absolutely LOVE the ATM-like idea too. .-= Candice´s last blog ..Alexander Keith’s Birthday Bash- The Most Popular Dead Guy I Know =-. Free toilets in McDonald’s? Maybe in France, but in Seattle the [email protected] make you buy something FIRST. So if you have to use the can, you have to buy your food and they hold it for you, but of course McD’s is only good for about three minutes before it becomes inedible. They had a security guard whose entire job was to guard the washroom. I should have peed on their dining room floor. Wow, I can’t believe they make you buy something in Seattle. I always thought all McDonalds let people use the bathrooms for free. Bummer. I can tell you the one in Boston by the Common requires tokens to get in! You have to buy something to get a token. Boston is a terrible city if you have to pee a lot. Public bathrooms are almost non-existent so people often have to go to the public library. That’s where the homeless have to go during the day. We’ve done some serious non-stop travel in Europe for the last 4 years and McDonald’s is handy for the free wifi in a pinch, BUT it doesn’t ALWAYS work. We were in France most of this past summer and although we loved the free wifi in the center last time in Paris, this time the wifi was not working. We did love one that was way out on the outskirts of town, but the libraries turned out to be a better deal for us this summer. One year in London we went to 4 different McDonald’s and none of them had working wifi. So it can really be hit and miss, thus do not count on it for that. BUT when lucky, one can sit for hours with a cup of coffee. More places should be so smart! .-= soultravelers3´s last blog ..Celebrating in Paris- Eiffel Tower =-. That is too bad it didn’t work at the Paris city centre. We went to a few in Paris and they worked fine, but you never know. Thanks for sharing the information about the libraries. Good to know. That is strange about them not working in London as well. I wonder what is up with McDonalds wifi? Luckily we never had that problem. I’m with you on the free and clean toilets! Definitely. The only other reason I would enter a McDonald’s when I lived in France for a few months was when my non-American friends wanted to go there. Free wi-fi? Cool. Last time I spent any significant time in France was a long time ago, so I don’t think many businesses offered it back then. It makes me feel old. The ATM-like machines sound awesome. I wonder why they don’t have those in the U.S. (that I have seen). Then again, while at home, I don’t tend to frequent McDonald’s. So true. I never know what is new in McDonalds at home. 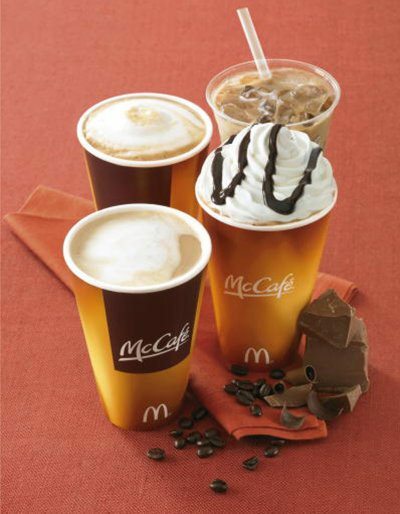 i was telling people about the McCafes and they said “Oh, we have them here too.” I haven’t seen them yet though. Free wifi was SUCH a clever idea for McDonalds…I’ve spent hours in a “McDo” hunched over a laptop. Other cafes take note! .-= Abi from Inside the Travel Lab´s last blog ..Climbing Mount Fuji – Japan =-. So true Abi. Other Cafes need to follow suit. Starbucks have started here in Ontario and I can’t tell you how popular they are again. They are packed every day with people on their laptops. And the great thing about at least us, is we hate loitering too long, so we are always buying something to make sure that we are still welcome. They must make some good cash by offering wifi. Totally agree with all your Points! Regardless of where you are in the world McDonalds always delivers on what it says it will. We always crave the Sundaes when we travel….or the fries.. I love the ATM like order machines! that is really cool. .-= Melanie´s last blog ..Oct 12- Great Tip To Do Before Flying with Your Kids =-. Mmm, the sundaes. We got ourselves an icecream or two, but it was McFlurries. The only thing was that in France (at least the McD’s we went to) you have to stir your own McFlurry, they don’t do it in the machine. But still yummy! I have been to that Paris McDonald’s! What you say is very true… it’s helpful to find a McDonald’s when you’re in an international pee pinch! I like that your reasons to enjoy McDonald’s abroad really has nothing to do with food–it’s all about convenience services like wifi and toilets! .-= Emily´s last blog ..Trekking with Pacha Mama in the Andes =-. Yep, that is what it is all about when we travel. Toilets always become so important. And this past year, it has been about the wifi. We never used to care about Internet, now it is an important part of our life. 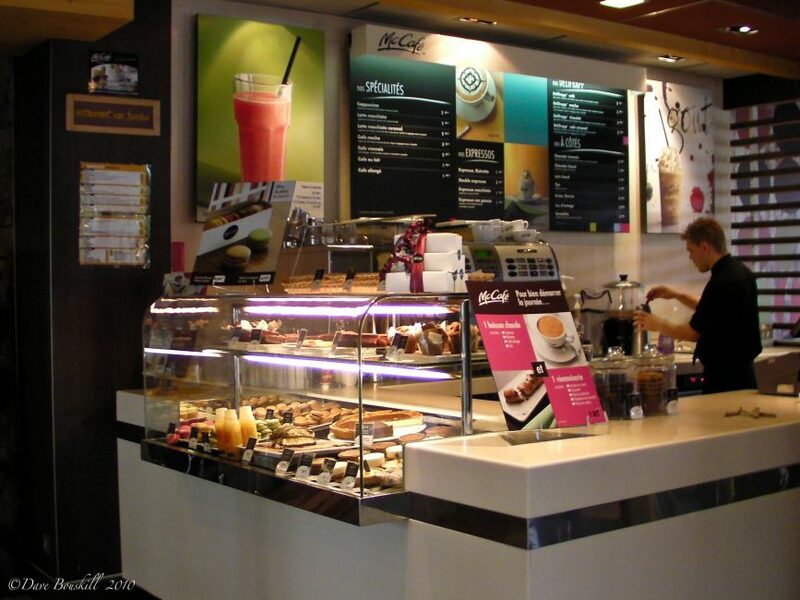 They’ve had McCafes in Australia since the 1990s. I wouldn’t eat at McDonald’s in France, though I might sneak into use their toilets. But then again, I would never eat at McDonald’s at home either. I don’t remember the last time I ate a McDonald’s hamburger and I think it’s been three years since I had their fries. I don’t get the point of bad food. .-= Caitlin @ Roaming Tales´s last blog ..United Nations of Food- Afghan in New York City =-. Haha, good point Caitlin about the bad food. I didn’t know that they had McCafes in Australia, we are so behind in Canada.